People living with dementia experience impaired cognition which may be seen in decreased short-term memory, decreased problem solving skills, decreased perceptual skills and personality changes. While there is no “cure” for dementia, various types of therapy may help an individual with dementia live independently as long as possible. 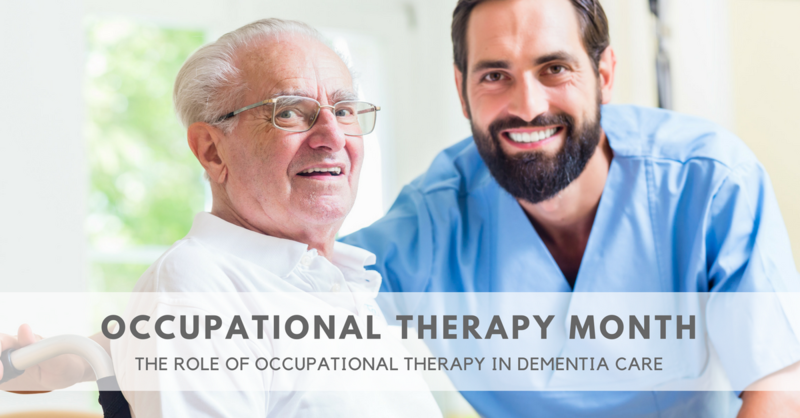 April is Occupational Therapy Month and we want to recognize the ways in which occupational therapists can help those living with dementia. Through an evaluation of the environment and certain adaptations, occupational therapists can assist someone living with dementia to live in their own homes as long as possible. For those living in long-term care and adult day health settings, occupational therapists can help individuals retain existing function for as long as possible. Health Promotion. Focusing on strengths of clients and promoting wellness of care providers to promote maximal performance in preferred activities. Modification. Promotes safe and supportive environments through adaptation and compensation. Person forgets what season it is when choosing clothing — Helping the care provider set up limited clothing selection to fit the season, while still addressing client control and self-efficacy. Person gets disoriented and wanders — Setting up the environment to enhance daily activity, including mobility within safe confines, and using technology to promote safety. For example, a fenced courtyard with stop signs at the gates could be all that is needed to keep the person oriented to his or her own yard. Personality changes — Teaching care providers the concepts of caring, non-defensive responding and orienting techniques, and working on determining the underlying emotion that may have precipitated the client’s behavioral outbursts. Repetitive non-productive behavior — Providing opportunities for engaging in occupational tasks that fulfill the person’s need to be productive and help support relationships with others. For example if the person once enjoyed crossword puzzles, perhaps simplified puzzles or word searches would still be enjoyable. Occupational therapists play an important role in the care of someone living with dementia, helping to enhance function, promote relationships and social participation and helping someone living with dementia to enjoy life. Consult with your loved one’s healthcare provider if you think your loved one may benefit from occupational therapy.